An inspired choice for an opera adaptation, especially in this WWI centenary year, Fly Away Peter is a compelling, haunting reflection on the inescapable horror of war. In his 1982 novel, a modern classic, David Malouf uses extensive imagery to convey his themes of the transience of life and the inevitable transformative power of war. Stripped back even further on the stage, the opera is almost pure allegory, with no need for traditional linear storytelling. Freed from the necessary structure of the page, Pierce Wilcox’s libretto enhances the most poetic elements of Malouf’s original text. To demonstrate the symbiotic closeness of the three protagonists, at times they finish each other’s thoughts in clipped, overlapping phrases that make no literal sense yet convey their meaning clearly. 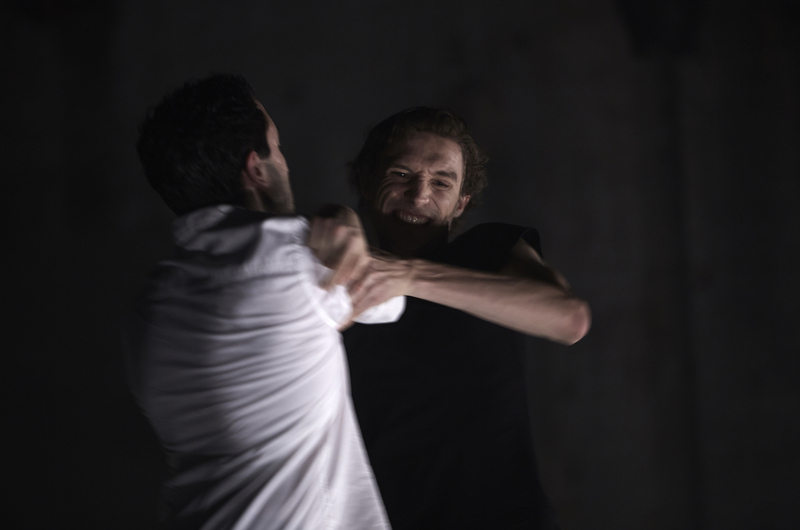 Thrown together as the world tilts towards war, working class battler Jim Saddler (Mitchell Riley) meets privileged scholar Ashley Crowther (Brenton Spiteri) while bird watching on Crowther’s land. Played as a younger woman in the opera, photographer Imogen Harcourt (Jessica Aszodi) shares the men’s love of birds, and the trio is soon caught up in the wonder of the sanctuary. Birdcalls are cleverly played by violin, fluttering clarinet and muted cornet. Wrenched from this Eden, Jim is shortly embroiled in trench warfare on the Western Front. Ashley takes Jim for a flight in his plane, where Jim sees the land the way birds see it. He wonders what the birds think of this metal monster flying alongside them. In a cleverly economical sequence, Jim meets his comrades, each given a subtly different vocal and physical presence by Spiteri. In composing this original score, Elliott Gyger successfully heightens the emotional impact of the dramatic action. His birdcalls, as mentioned above, are wonderful, and he makes a strong distinction in sound as the setting moves from the idyll of Queensland to the confronting terror of the trenches. Gyger’s arrangements place all the melody and musical beauty in the voices, a choice that works brilliantly with the three stunning voices in the cast. Jack Symonds conducts a chamber orchestra of seven talented, flexible musicians. Listening analytically, the score is extremely challenging, yet the thorough musical preparation allows for a relaxed, natural performance. Rarely performed in the Fairfax Studio, opera sounds surprisingly good in the space, the amphitheatre design clearly suiting the style. Director Imara Savage imbues her young cast with a strong sense character, providing clarity and gravitas to the scenario even when expositional narrative is sparse. For those unfamiliar with the text, a quick read of the précis of the eight scenes in the complimentary program is all that is needed to appreciate the setting. As we hear of the deaths of each of Jim’s comrades, Savage mostly implies the violence of war, using just a single device to convey the unshakeable impact of witnessing such horror. 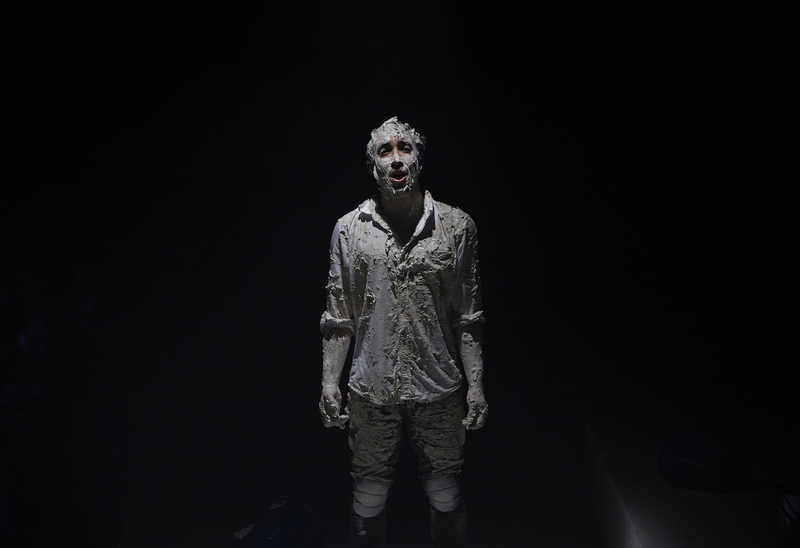 The actors coat themselves in sticky clay-like mud, a visceral, outward sign of the memories that cannot be washed away. 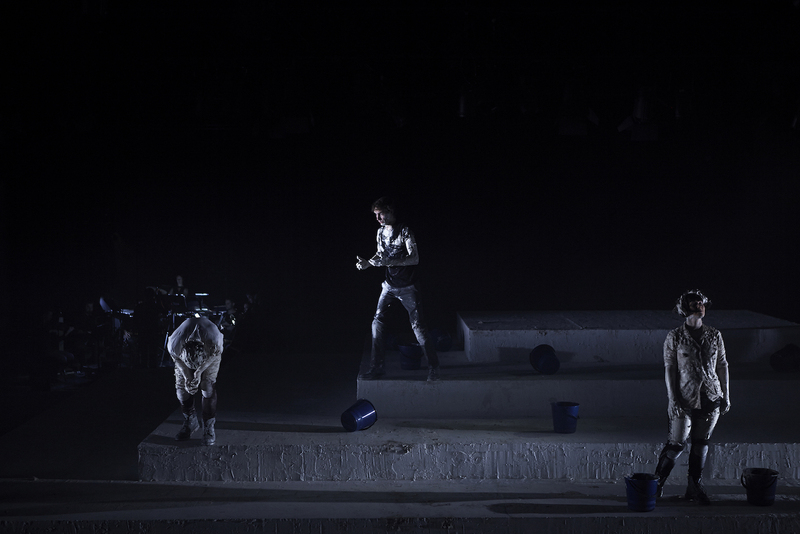 Savage is supported by movement director Lucas Jervies, who creates a physical language for the three characters and their interactions. Elizabeth Gadsby’s sparse design is incredibly effective in fluidly portraying time and place. A series of white platforms rise, pyramid-like, in the open space. In close alignment with the non-literal playing style, Gadsby’s costumes are neutral, modern daywear. A large collection of blue plastic buckets is used to dig the trenches and, later, to represent the multitude of graves of the fallen. 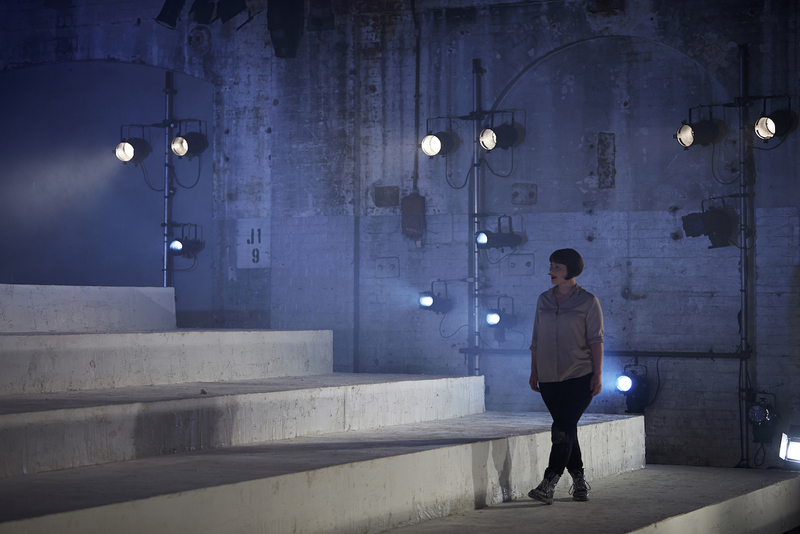 Having played its premiere season at Sydney’s Carriageworks in May, Verity Hampson has reconfigured her excellent lighting design for Fairfax Studio, Arts Centre Melbourne. Hampson paints the white surfaces with light and shadow, creating depth and texture. Even in an open space without a proscenium arch, Hampson can draw in the focus for an intimate scene. The claustrophobic isolation of Jim’s slow death in the mud is all too clear. With the lean physique of a wiry youth, Riley conveys a masculine presence tempered with a sensitive, insightful soul. Riley’s expressive baritone voice captures the pain and confusion of Jim’s encounters, his deeper register adding dramatic weight to the character. Having recently taken up a Young Artist position at National Opéra de Lyon, France, Spiteri returns home briefly for this Melbourne season of Fly Away Peter. With voices so exposed, Gyger’s music is particularly well served by the rich, gorgeous tone Spiteri’s tenor. The highly attractive timbre of Spiteri’s vocals point to the aristocratic nature of the character, as well as highlighting his empathetic side. A strong actor, Spiteri scores the one laugh of the night as a youth whose voice has not quite broken. Soprano Aszodi once again displays finely tuned musicality and gently understated acting in creating an original role in a modern opera. Always on stage yet not always in the spotlight, Imogen must go on a painful journey along with the men yet without the direct exposure to war. Singing with sweet, aching beauty, Aszodi perfectly captures the balance of maintaining a presence while supporting the central male roles. Melbourne has blessed with a number of boutique opera productions this year. Gently exhilarating and deeply moving, Fly Away Peter is a must-see for the discerning operagoer. Fly Away Peter plays at Fairfax Studio, Arts Centre Melbourne until 24 October 2015.